Share the post "News: CAMDEN ROCKS – over 400 acts over two days (1-2 June 2019)"
Camden Rocks Festival have finalised their line-up for this year’s event (1-2 June). Amongst the bands appearing, and featured in GRTR! reviews/playlists, are Skarlett Riot (pictured), The Wonder Stuff, Ginger Wildheart, The Virginmarys, Big Boy Bloater, Daxx & Roxane, Federal Charm and Dig Lazarus. Also announced are headliner Frank Turner, English reggae-influenced punk rockers The Ruts DC, celebrating the 40th anniversary of debut album “The Crack”, critics’ favourite metal-core four-piece Glamour Of The Kill, singer-songwriter Sean McGowan, anthemic pop-rock Londoners Luna Bay, acoustic-duo Undead Raisins (Andy & Colin from Hundred Reasons), and many more. Taking place on Saturday 1st and Sunday 2nd June 2019, and now in its eighth year, the festival gives music fans the opportunity to see over 400 bands play across 20 venues all within a stones throw of each other in Camden Town, London. 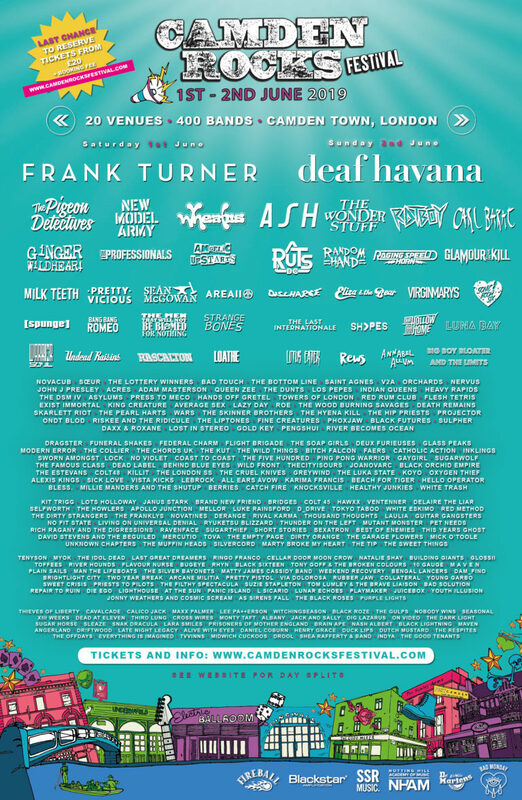 This entry was posted in Festivals & Large Events, NEWS and tagged 1-2 June 2019, alternative, Camden Rocks Festival, Camden Town, Deaf Havana, Frank Turner, indie, London, rock, The Pigeon Detectives, The Ruts DC. Bookmark the permalink.